Panetolikos Stadium is a multi-purpose sporting arena located in the small city of Agrinio within the Aetolia-Acarnania region of Greece. Used primarily for the football matches of local team Panetolikos F.C, the ground has a seating capacity of 7,500 and dates back to the 1930s. The original version of Panetolikos Stadium first opened in 1930 containing the most basic of facilities such as terracing and no place for supporters to sit. It wasn’t until around 20 years later in the 1950s that the first stand would be erected on the eastern side of the pitch. A similar time period of elapsed once again before the next expansion occurred at the ground with a new main stand constructed in the 1970s along the western side of the pitch. 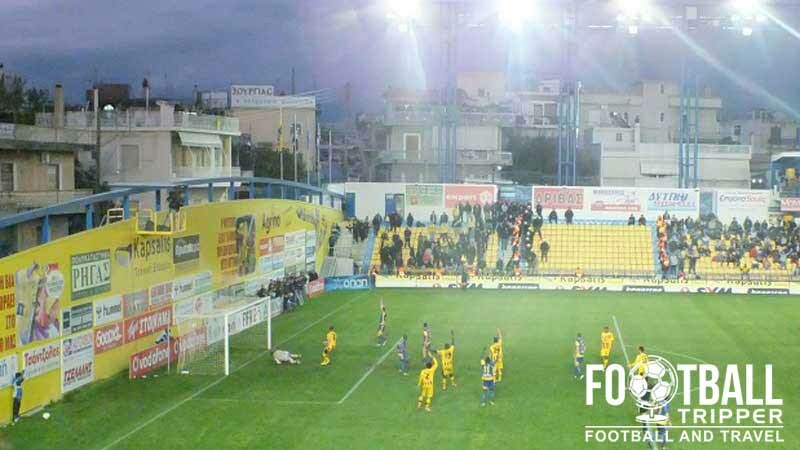 With the eastern stand finally receiving an opposite number Panetolikos Stadium began to flourish as the club looked to establish across Greece. It was during this period that the record attendance was set, and in the 1976/1977 season a reported 11,012 supporters crammed into the ground to see Panetolikos take on Greek giants Olympiakos. This marked the second time in the club’s history that they competed in the high-tier of Greek Football which was then known as Alpha Ethniki. 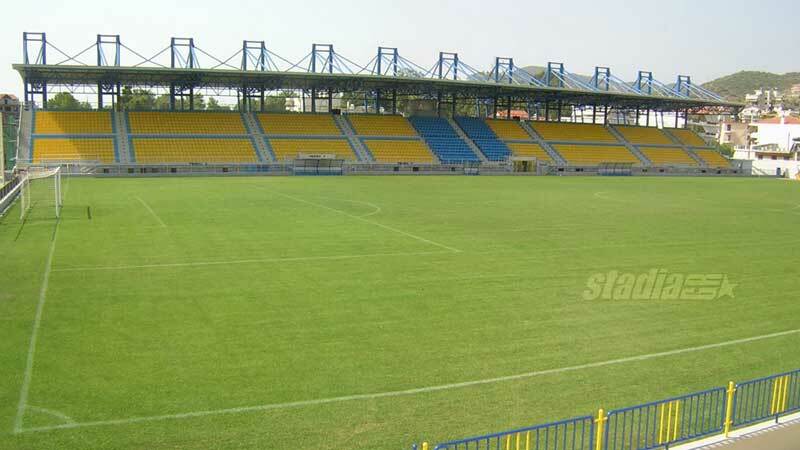 Beginning to languish after first opening 75 years ago a decision was made by Panetolikos FC in 2005 to revamp the stadium and modernise the two adequate but rapidly ageing stands. A proper cantilevered roof was added to the main stand and the club opened a new fan shop and cafe at the ground in line with other stadia across Europe. 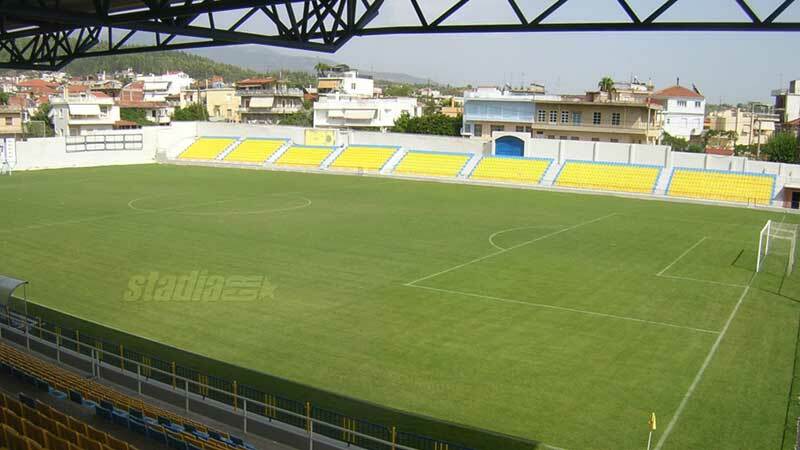 The most recent expansion of Panetolikos Stadium occurred during the 2011/2012 season when the club were promoted to the Superleague for the first time in their history. A new 1,400 capacity curva was added behind the southern goal-end along Prousiotissis Street, and UEFA approved floodlights were installed. Panetolikos Stadium is comprised of Two stands: East and West. Away fans are usually housed in the southernmost part of the west stand as shown by the green block in the above seating plan. 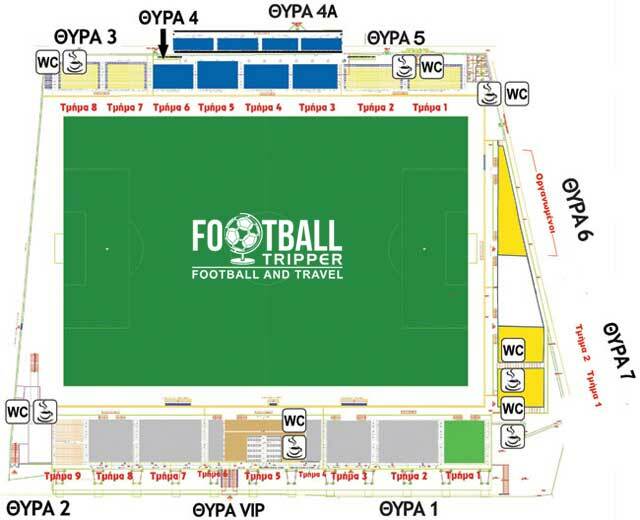 Depending on the number of visiting supporters, the away fans can either be allocated one or two sections of seating. Fans of Panetolikos can purchase a whole range of merchandise of the club from the official online store. Unfortunately we couldn’t find any information regarding the opening times of the actual fan shop although by all reports there definitely is one at the stadium. There aren’t any guided tours available of Panetolikos Stadium, and it’s unlikely that there ever will be – at least to the general public. Tickets to see Panetolikos can either be purchased online (This is actually quite rare in Greece) or in person from the ticket booths just before kick-off on matchdays as attendances only usually average between 5,000 – 6,000. Prices generally start as low as €10.00 for something behind the goal and up to €20.00 for a prime central seat in the main stand. Panetolikos Stadium is located approximately 850 metres north of Agrinio city centre which is often defined as being the area around “Platia Dimokratias” – Democracy Plaza. This means that most Football Trippers can make their way to the ground in less than 10 minutes by foot. Located in a dense urban neighbourhood there doesn’t appear to be any parking available directly at the stadium. The city doesn’t boast a railway station which means hiring a rental car is very much advised for inter city travel in the Aetolia-Acarnania region. Another look at Panetolikos Stadium from the outside. The blue towers you can see are the floodlights. Agrinio Airport is located less than than 10 miles south-west of the city centre via the long Epar.Od. Aggelokastrou strecth of road, however it’s isn’t used used for commercial aviation purposes. This means that the closest International Airport is Aktion National Airport 92 km away. The largest cluster of hotels is located around Democracy Plazy with three obvious choices being Hotel Leto, Agrinio Imperial Hotel and Hotel Galaxias. The closest place to stay to Panetolikos stadium is undoubtedly Marpessa Hotel however it is slightly more expensive as a four star hotel.